Summer is approaching and with it the time where you don't feel like wearing heavy perfumes. 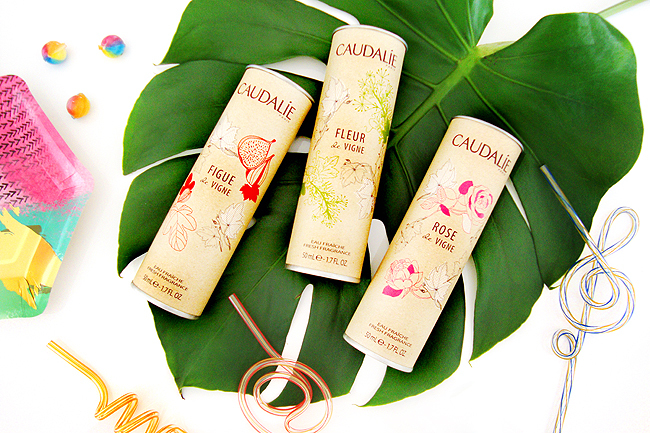 Caudalie's Eau Fraîche Series might be the answer: It's fresh like a summer garden and just a subtle hint of scent that lingers on your skin. Store one of the beautiful bottles in your desk drawer and refresh yourself several times a day. Since all Eau Fraîches are not photosensitive – unlike most perfumes – you can wear them during the whole summer without being afraid of the sun. 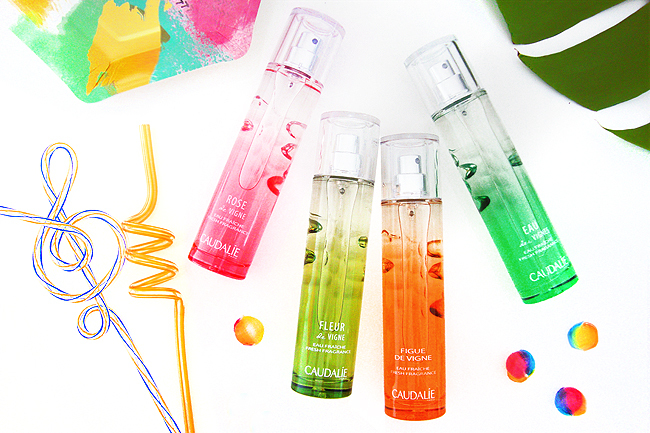 There are five Eau Fraîches available, I tested four of them for you, including the newest addition to the line launched this June. A floral fragrance with roses, berries, rhubarb, magnolia, and musk, launched in 2015. I believe they are two sorts of people when it comes to rose fragrances: People who love them and people who hate them. If you belong to the first kind (like me), this might be for you, with its fruity and floral charm. The lovely pink bottle gets an extra point from me. The Fleur de Vigne is a flower that only blooms a few days in June, heralding the grape harvest 110 days later. This lightweight green water combines white rose, pink pepper, and watermelon with grapefruit, mandarin, and cedar. 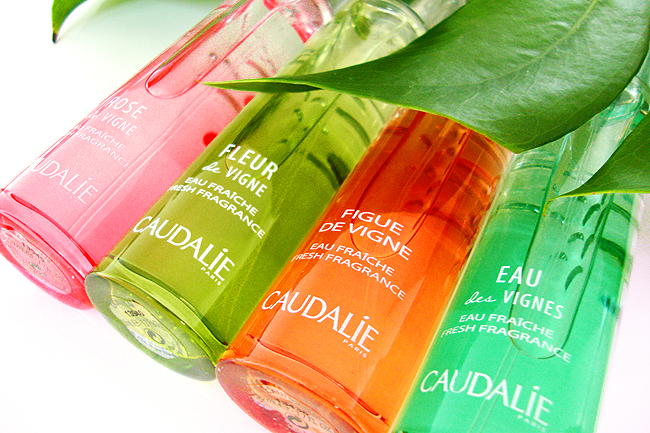 It was the first Eau Fraîche from Caudalie, released 2002. In my opinion, it is the freshest and most uplifting fragrance of all. It feels very energizing and like a little trip to a shady summer garden. As the name says, the star of this Eau Fraîche is the fig. It mingles with citrus fruit notes and white wood in the 2015 launched fragrance. 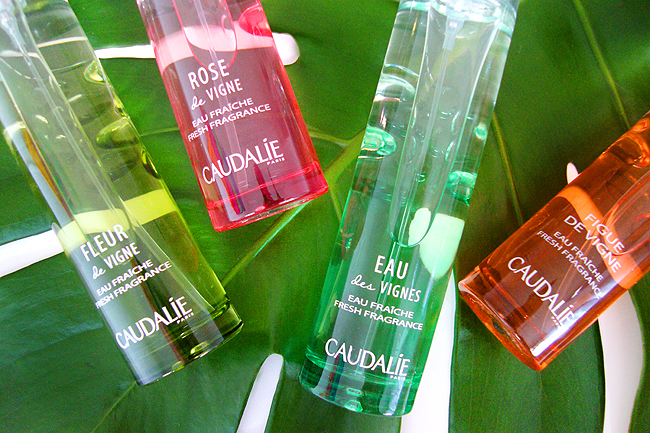 My least favourite Eau Fraîche from Caudalie, even if fruity fragrances are booming at the moment. I think it smells slightly like a sweet soap or a nice cleaning liquid. Maybe it's because I am not a big lover of the scent of figs anyway, but this is just not my Eau Fraîche. The newest addition to the Eau Fraîche Series is a composition of bergamot, iris and white musk. It was launched in June 2017. It was love at first smell: It's sparkling, sensual and vitalising. I want to smell it again and again and think we will become close friends this summer. If I had to choose one favourite smell in the world, it would be the one of bergamot, just like a fresh cup of Earl Grey tea and this fragrance captures my beloved scent very well. Yes, yes, yes Eau des Vignes, I love you very much! I've heard good things about this caudalie temizleyiciler product. Going on my wish list now!